The Department of Health (DH) today (January 31) urged clients who consulted a registered Chinese medicine practitioner (CMP), Tang Chau (also known as Tang Po-sang (transliteration)), practising at the G/F, 255 Ki Lung Street, Sham Shui Po, Kowloon, to take note of the cream products he prescribed as they were found to contain undeclared Western drug ingredients. 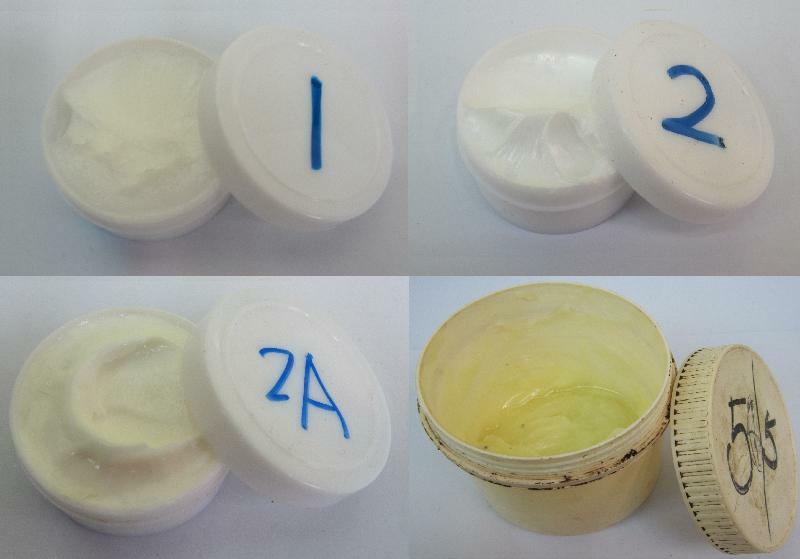 Acting upon intelligence, the DH raided the above CMP's premises and seized a quantity of cream products for analysis. Testing results from the Government Laboratory confirmed that samples of the cream products labelled as "1", "2", "2A" and "5/5" contained undeclared Western drug ingredients namely clobetasol propionate, fluocinonide, dexamethasone acetate and chloramphenicol respectively (details of the results are listed in the attachment). Preliminary investigation revealed that the CMP had purchased the cream products in the Mainland and prescribed them to his patients. During the operation, a man aged 82 was arrested by the Police for illegal possession of Part 1 poisons, unregistered pharmaceutical products and antibiotics. "Clobetasol propionate, fluocinonide and dexamethasone acetate are corticosteroids and prescription medicines for treating inflammation. Inappropriate use of corticosteroids may cause serious side effects such as Cushing's syndrome, with symptoms including moon face and muscle atrophy. Chloramphenicol is an antibiotic used for the treatment of various bacterial infections. It can cause hypersensitivity when given topically. In this incident, the DH has not received reports of related adverse incidents," the spokesman for the DH explained. According to the Pharmacy and Poisons Ordinance (Cap 138), illegal possession of Part 1 poisons and unregistered pharmaceutical products are criminal offences. The maximum penalty for each offence is a fine of $100,000 and two years' imprisonment. In addition, the Antibiotics Ordinance (Cap 137) also prohibits illegal possession of antibiotic. Offender is liable to a maximum penalty of a $30,000 fine and one year's imprisonment. Upon completion of the investigations, the DH will consult the Department of Justice on prosecution matters. The DH has already referred the case to the Chinese Medicine Council of Hong Kong for consideration of possible disciplinary action. Members of the public who have been prescribed with cream products by the above CMP who feel unwell or are in doubt should consult healthcare professionals as soon as possible. They should submit the medicines to the DH's Chinese Medicine Division at 16/F, AIA Kowloon Tower, Landmark East, 100 How Ming Street, Kwun Tong, Kowloon, during office hours for disposal.